Right off the top, the 21 inch stride length on the Smooth CE 8.0LC means that this is not your everyday elliptical trainer. Not only does this accommodate even the tallest user, it also lets you train a greater set of muscles. The heavy duty construction makes a 400 lb maximum user weight possible and the Smooth CE 8.0LC elliptical avoids using rollers, which makes it unusually quiet compared to other trainers. Handlebars contribute to a full body workout. Controlling the Smooth CE 8.0LC is with a back-lit touch screen, similar to what you find on many models used in gyms and health clubs. The console can be tilted for easy reading regardless of your height. There are total of 24 resistance levels and 21 workout programs offer plenty of variety. Heart rate on the Smooth CE 8.0LC elliptical trainer is monitored either through contact grips or wireless with a chest strap which also controls a training program that will automatically adjust resistance to keep you in your selected heart rate zone. The warranty on the Smooth CE 8.0LC elliptical trainer is excellent, lifetime on the frame and brake, 10 years on parts and 2 years on labor. The Smooth CE 8.0LC elliptical trainer combines gym level quality with all the features you could ask for, backed by the Smooth reputation and an excellent warranty as well as free delivery. 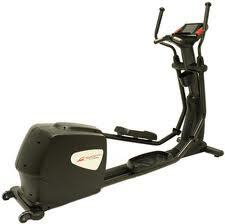 The Smooth CE 8.0LC elliptical trainer has won several awards and we highly recommend it.